A masculine card today. Something that I find not always easy to do. IMHO masculine cards can’t be too fussy and need to be in “guy” colors. This card is for the Teapot Challenge at Splitcoast and for the Mojo Monday 198 sketch. This card will be going to a young father who has a wife and infant son. He is currently battling cancer and needs a lift. My card starts out with a cardbase in Soft Suede. The next layer is made up of two pieces, one being a striped designer paper in River Rock and the other a piece of River Rock that’s been dry embossed and sponged with Soft Suede. It has also been stamped with a faux stitching pattern. Next comes a banner in River Rock that’s been dry embossed and a slightly smaller banner in some Soft Suede designer paper. Next comes a layer of Soft Suede that’s been cut with a square nestie die with a slightly smaller square River Rock die cut that’s been stamped in Soft Suede. I punched out another piece of the dotted Soft Suede designer paper and again dry embossed it but actually used the reverse side to create some divots in the “golf ball”. The “golf ball” has been popped up on a large dimensional. 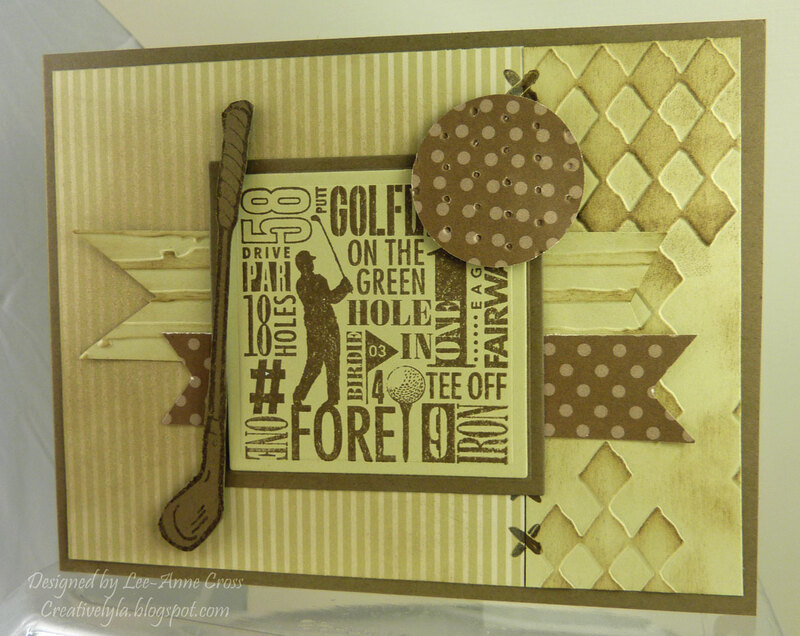 And finally, I stamped the golf club image in Soft Suede on the same color and cut it out and popped it up on dimensionals. This is a great masculine card….I know it will lift his spirits! Oh this is fun, love all of the textures and patterns! I just found your blog Lee-Anne. It is gorgeous and I love all the cards. This is a super masculine card, love the colors, and all the texture. Pop over to my blog for a visit. Next Next post: Style is Everything?